S 215 notices. Scope of appeal. Change of use. Breach of enforcement notice prosecutions. LDC S 187B injunctions. Race equality duty Procedure. At committee. On appeal. High Court challenge. Conditions precedent. 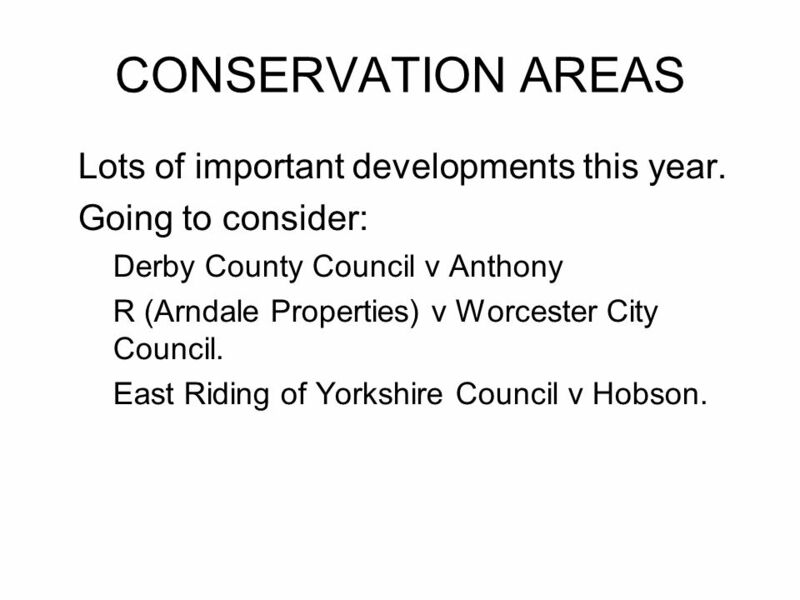 3 CONSERVATION AREAS Lots of important developments this year. 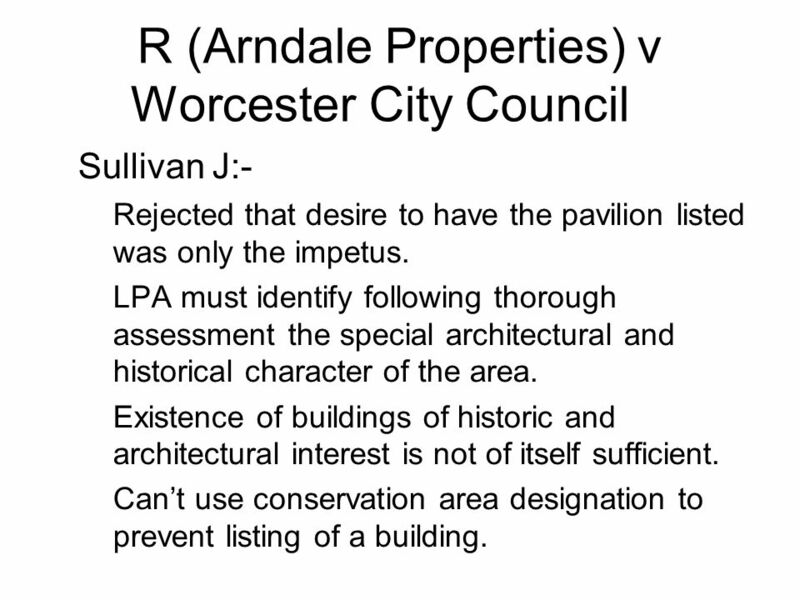 Going to consider: Derby County Council v Anthony R (Arndale Properties) v Worcester City Council. 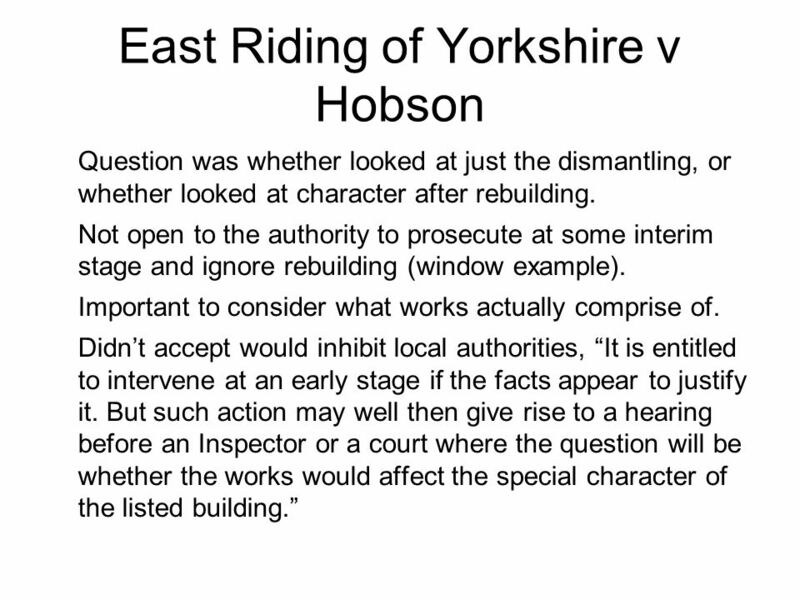 East Riding of Yorkshire Council v Hobson. 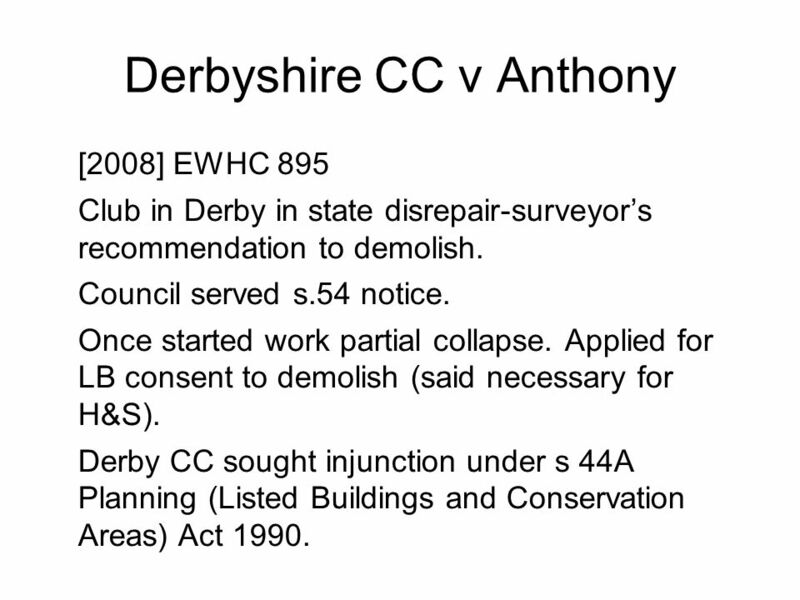 EWHC 895 Club in Derby in state disrepair-surveyor’s recommendation to demolish. Council served s.54 notice. Once started work partial collapse. Applied for LB consent to demolish (said necessary for H&S). 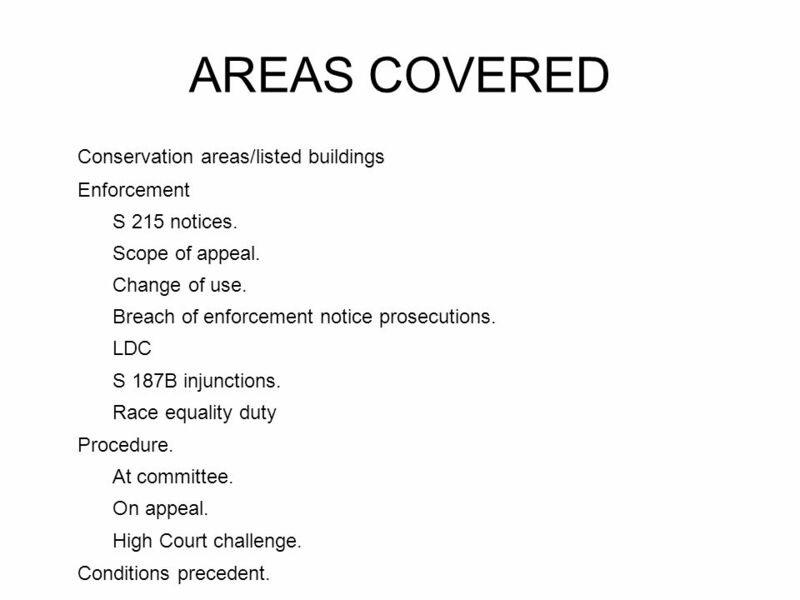 Derby CC sought injunction under s 44A Planning (Listed Buildings and Conservation Areas) Act 1990. Wyn Williams: Question of fact. 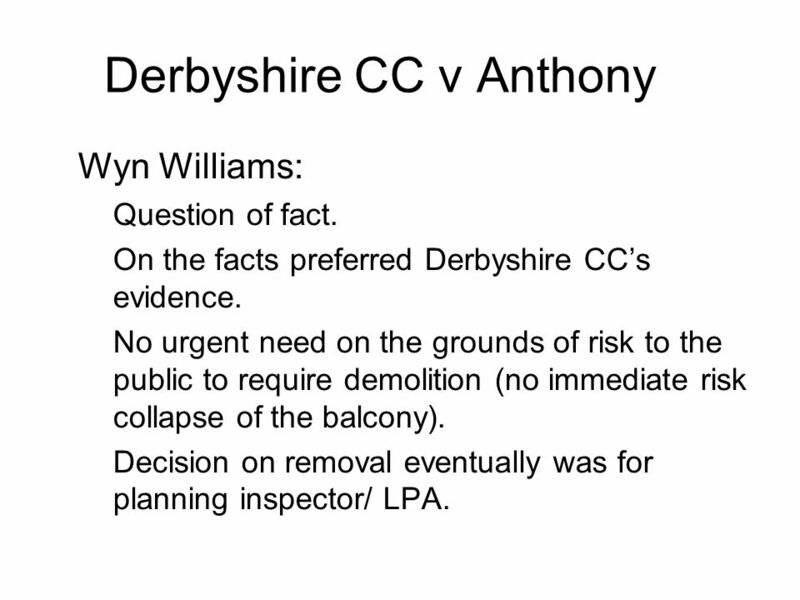 On the facts preferred Derbyshire CC’s evidence. No urgent need on the grounds of risk to the public to require demolition (no immediate risk collapse of the balcony). 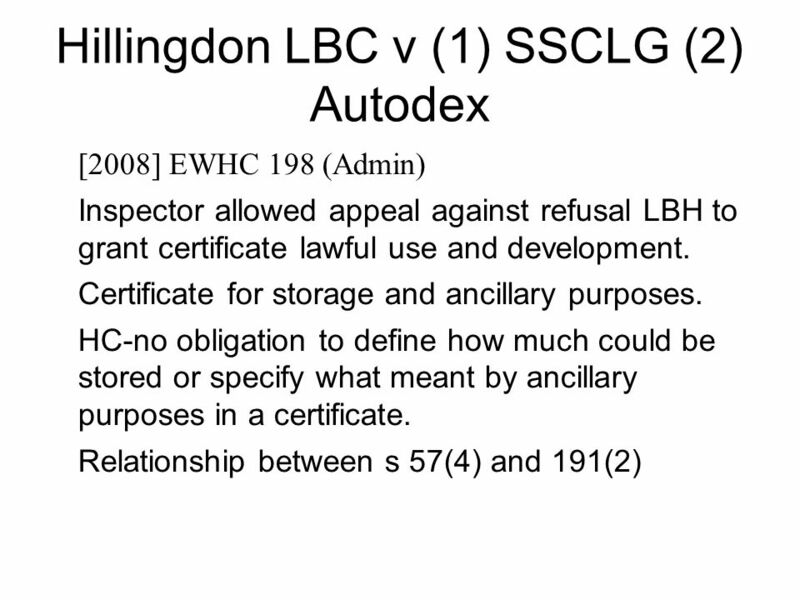 Decision on removal eventually was for planning inspector/ LPA. 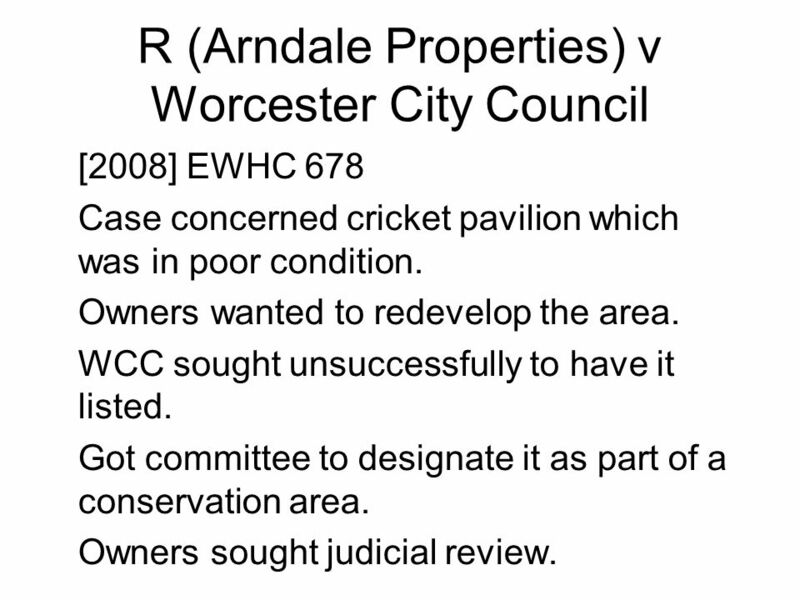 EWHC 678 Case concerned cricket pavilion which was in poor condition. Owners wanted to redevelop the area. WCC sought unsuccessfully to have it listed. Got committee to designate it as part of a conservation area. Owners sought judicial review. Sullivan J:- Rejected that desire to have the pavilion listed was only the impetus. LPA must identify following thorough assessment the special architectural and historical character of the area. Existence of buildings of historic and architectural interest is not of itself sufficient. Can’t use conservation area designation to prevent listing of a building. EWHC 1003 Grade II listed (including stableblock). Granted consent to undertake works to the stable block. Works went significantly beyond what had consent for-wholly dismantled and reconstructed with some original bricks. S Act: “no person shall execute or cause to be executed any works for the demolition of a listed building or for its alteration or extension in any manner which would affect its character as a listed building.” Offence not to comply under s.9. Charged with altering a building contrary to s.7. Question was whether the alteration affected its character as a listed building. 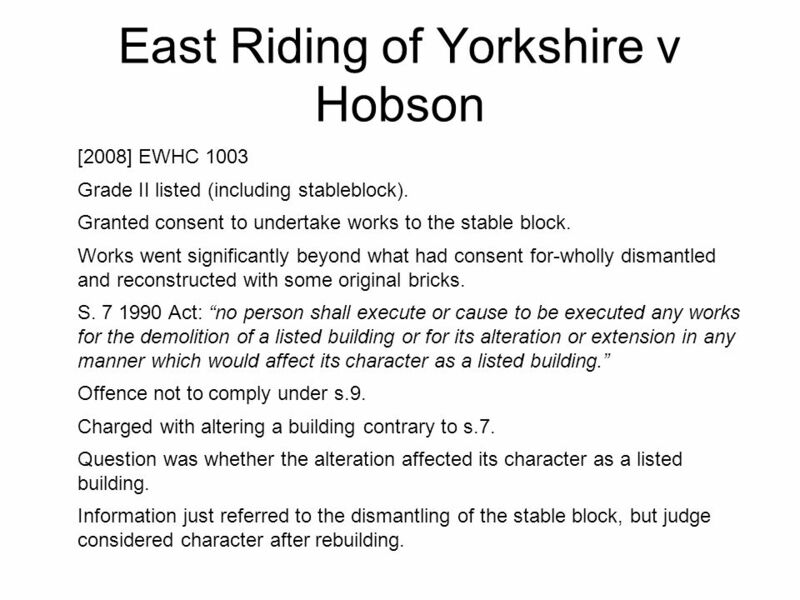 Information just referred to the dismantling of the stable block, but judge considered character after rebuilding. 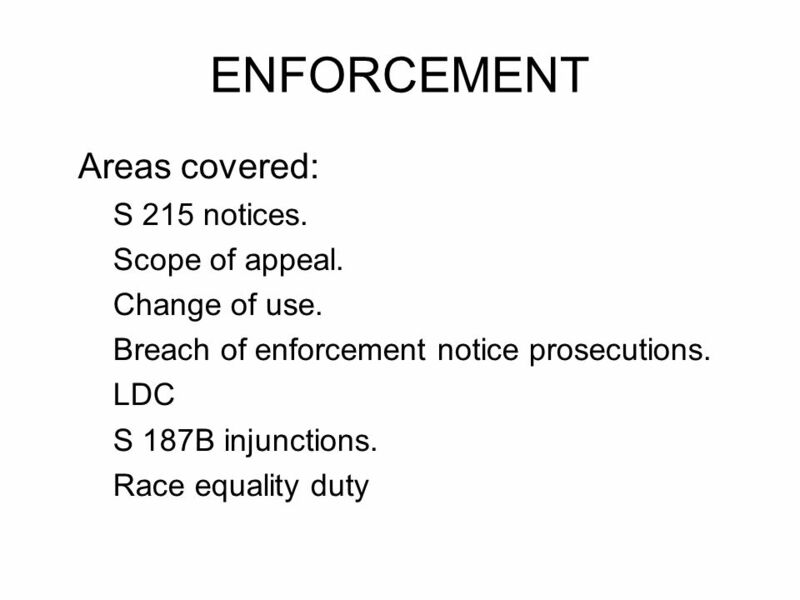 10 ENFORCEMENT Areas covered: S 215 notices. Scope of appeal. EWHC 203 Appeal by way case stated. To do with who s. 215 (land adversely affecting amenity of the neighbourhood) notice should be served on. Notice referred to the whole building, but steps to be taken only referred to the 1st floor and above. Served on owners building and occupiers all floors. 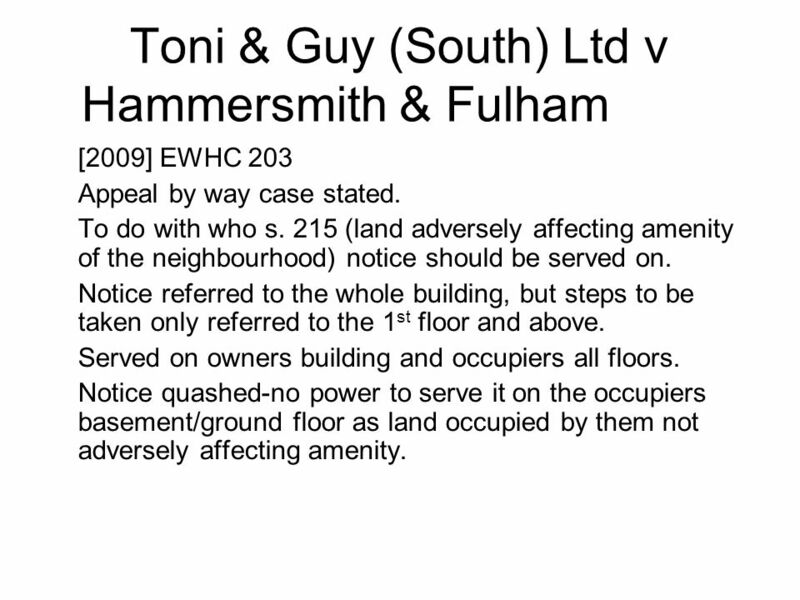 Notice quashed-no power to serve it on the occupiers basement/ground floor as land occupied by them not adversely affecting amenity. Challenging refusal inspector to hold full rehearing. 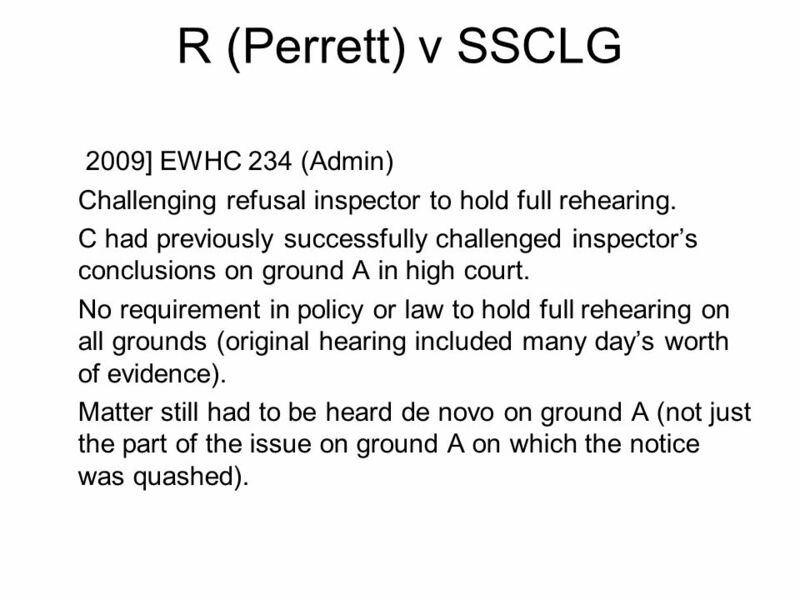 C had previously successfully challenged inspector’s conclusions on ground A in high court. No requirement in policy or law to hold full rehearing on all grounds (original hearing included many day’s worth of evidence). Matter still had to be heard de novo on ground A (not just the part of the issue on ground A on which the notice was quashed). 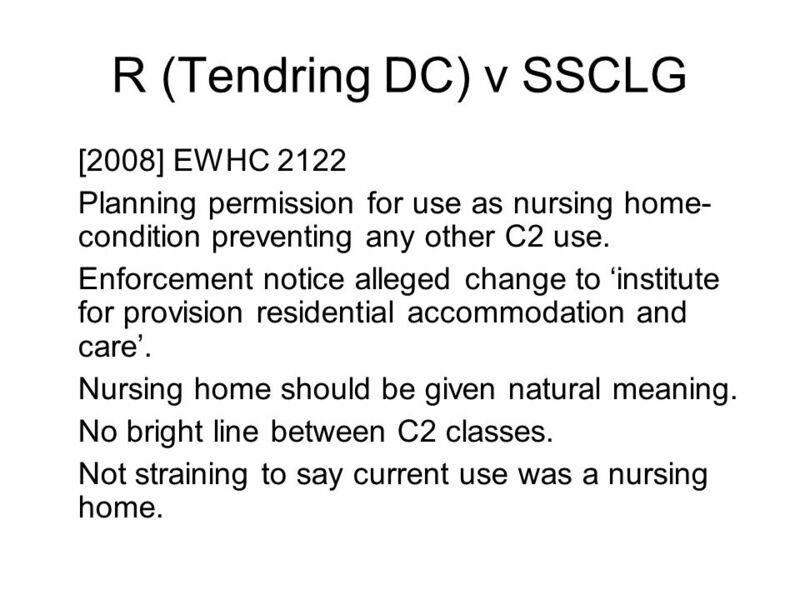 Planning permission for use as nursing home- condition preventing any other C2 use. Enforcement notice alleged change to ‘institute for provision residential accommodation and care’. Nursing home should be given natural meaning. No bright line between C2 classes. Not straining to say current use was a nursing home. EWHC 734 Appeal by case stated. 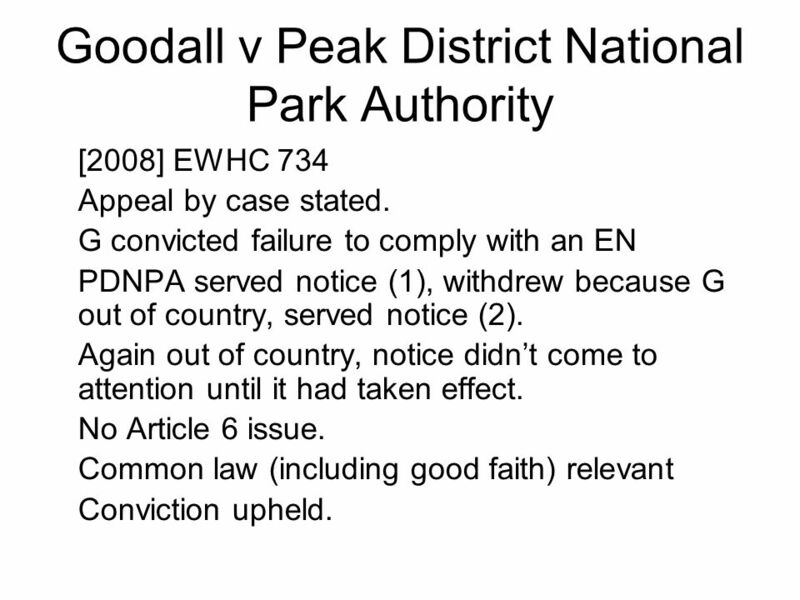 G convicted failure to comply with an EN PDNPA served notice (1), withdrew because G out of country, served notice (2). Again out of country, notice didn’t come to attention until it had taken effect. No Article 6 issue. Common law (including good faith) relevant Conviction upheld. EWCA Civ 476 Appeal against upholding of enforcement notices. 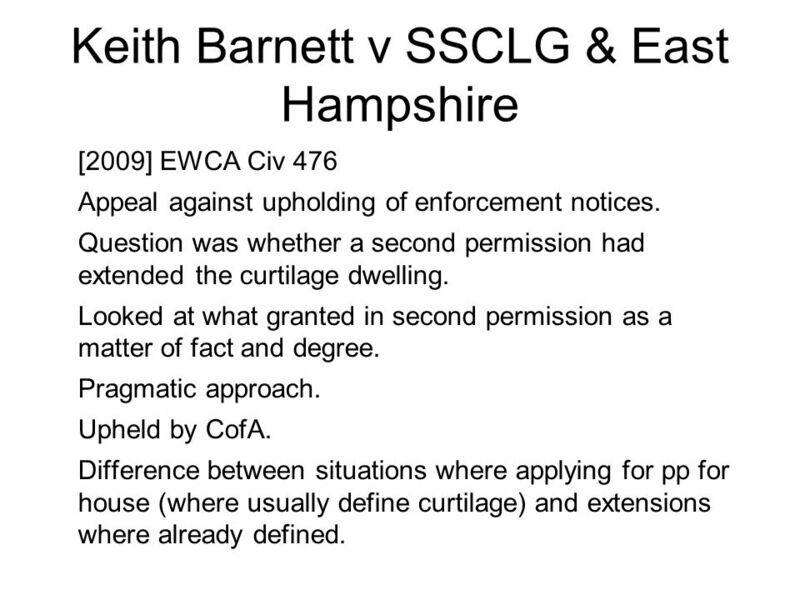 Question was whether a second permission had extended the curtilage dwelling. Looked at what granted in second permission as a matter of fact and degree. Pragmatic approach. Upheld by CofA. Difference between situations where applying for pp for house (where usually define curtilage) and extensions where already defined. Green belt/ AONB/ special landscape area. 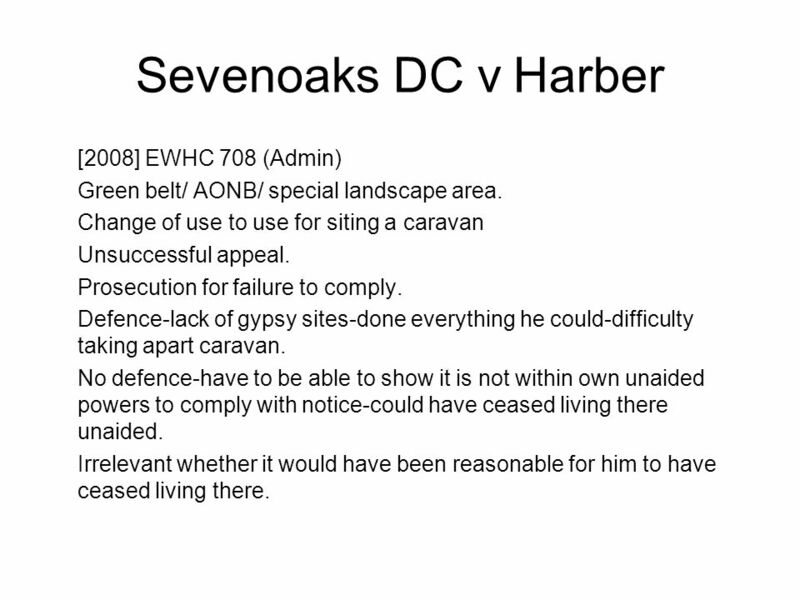 Change of use to use for siting a caravan Unsuccessful appeal. Prosecution for failure to comply. Defence-lack of gypsy sites-done everything he could-difficulty taking apart caravan. No defence-have to be able to show it is not within own unaided powers to comply with notice-could have ceased living there unaided. Irrelevant whether it would have been reasonable for him to have ceased living there. 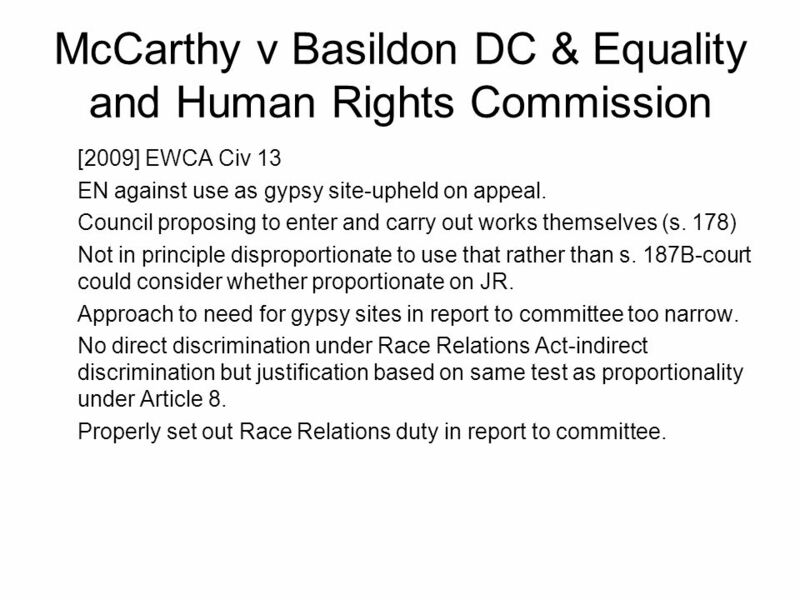 EWCA Civ 13 EN against use as gypsy site-upheld on appeal. Council proposing to enter and carry out works themselves (s. 178)‏ Not in principle disproportionate to use that rather than s. 187B-court could consider whether proportionate on JR. Approach to need for gypsy sites in report to committee too narrow. No direct discrimination under Race Relations Act-indirect discrimination but justification based on same test as proportionality under Article 8. Properly set out Race Relations duty in report to committee. Bias/predetermination. Planning appeals Role inspector Procedural unfairness High court challenges. 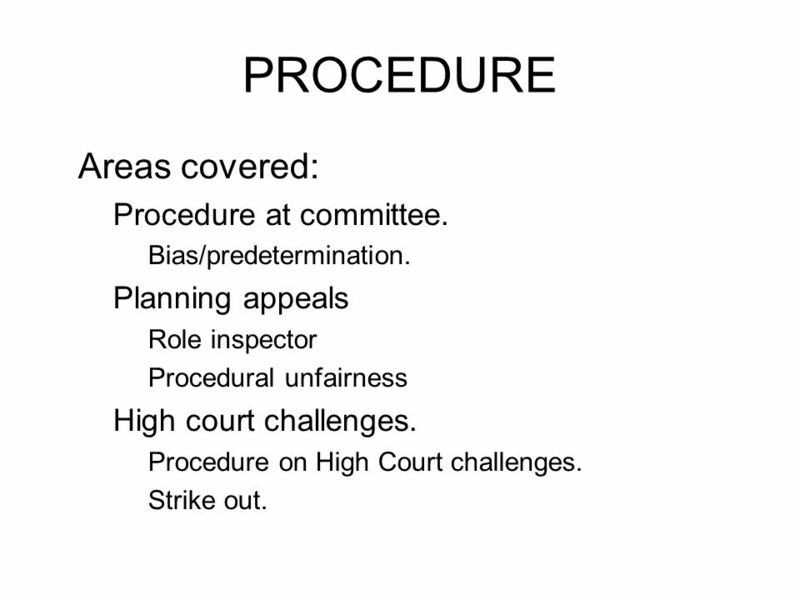 Procedure on High Court challenges. Strike out. 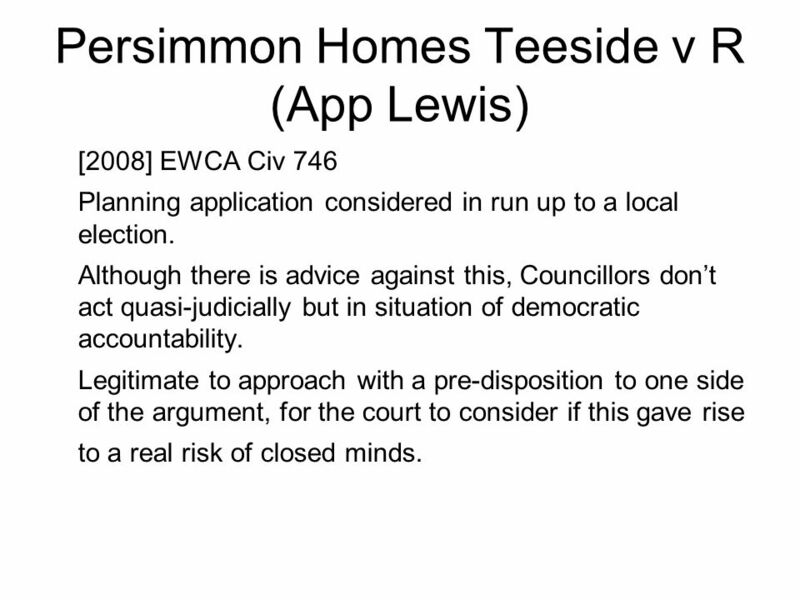 EWCA Civ 746 Planning application considered in run up to a local election. Although there is advice against this, Councillors don’t act quasi-judicially but in situation of democratic accountability. Legitimate to approach with a pre-disposition to one side of the argument, for the court to consider if this gave rise to a real risk of closed minds. 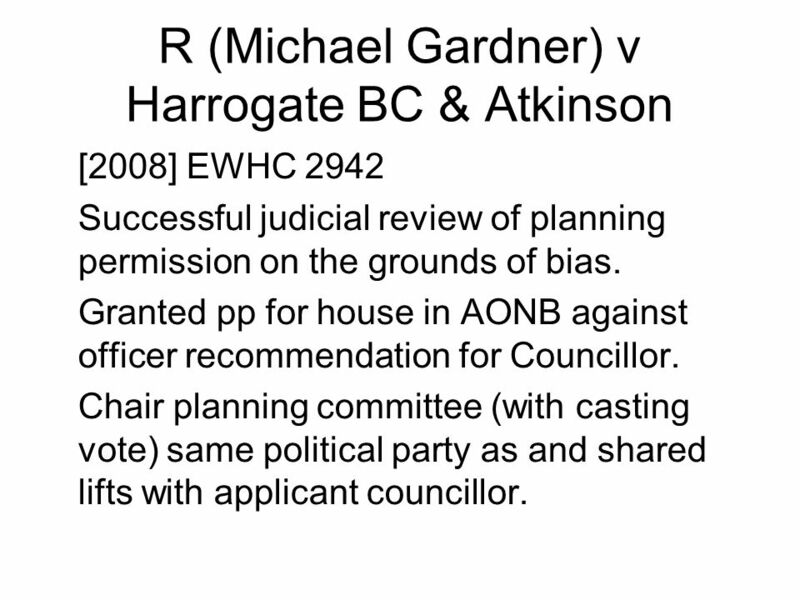 EWHC 2942 Successful judicial review of planning permission on the grounds of bias. Granted pp for house in AONB against officer recommendation for Councillor. Chair planning committee (with casting vote) same political party as and shared lifts with applicant councillor. 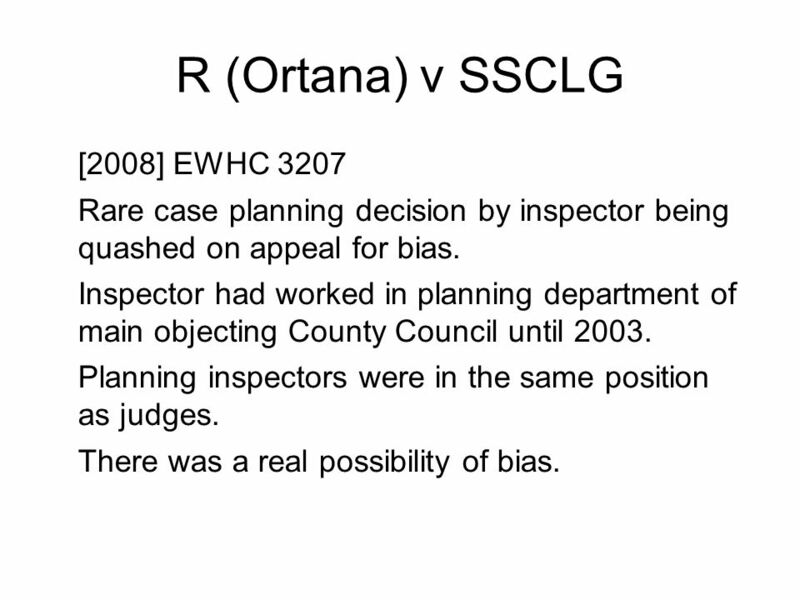 Rare case planning decision by inspector being quashed on appeal for bias. Inspector had worked in planning department of main objecting County Council until 2003. Planning inspectors were in the same position as judges. There was a real possibility of bias. 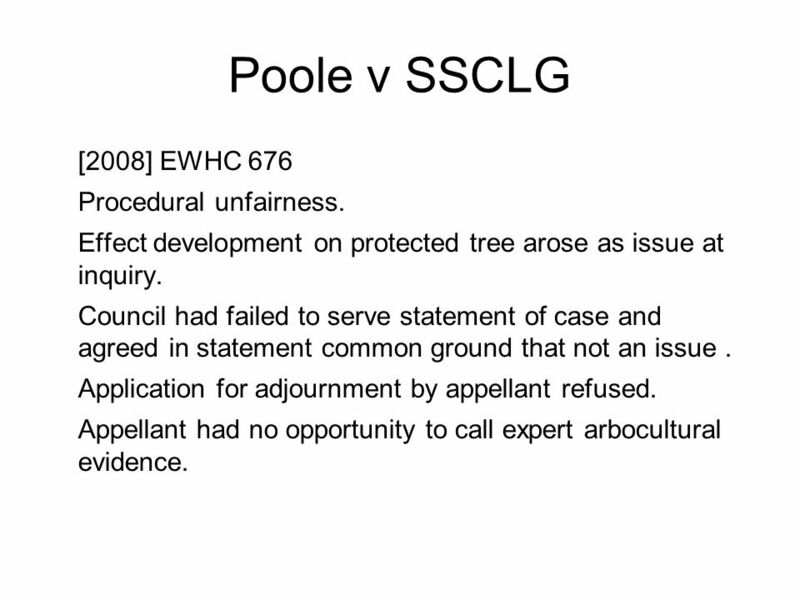 23 Poole v SSCLG  EWHC 676 Procedural unfairness. Effect development on protected tree arose as issue at inquiry. Council had failed to serve statement of case and agreed in statement common ground that not an issue . Application for adjournment by appellant refused. Appellant had no opportunity to call expert arbocultural evidence. 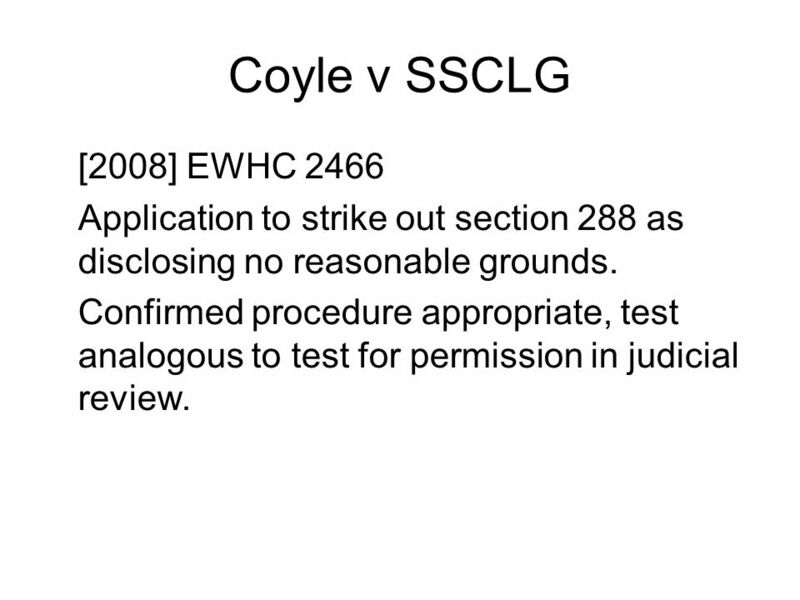 24 Coyle v SSCLG  EWHC 2466 Application to strike out section 288 as disclosing no reasonable grounds. Confirmed procedure appropriate, test analogous to test for permission in judicial review. 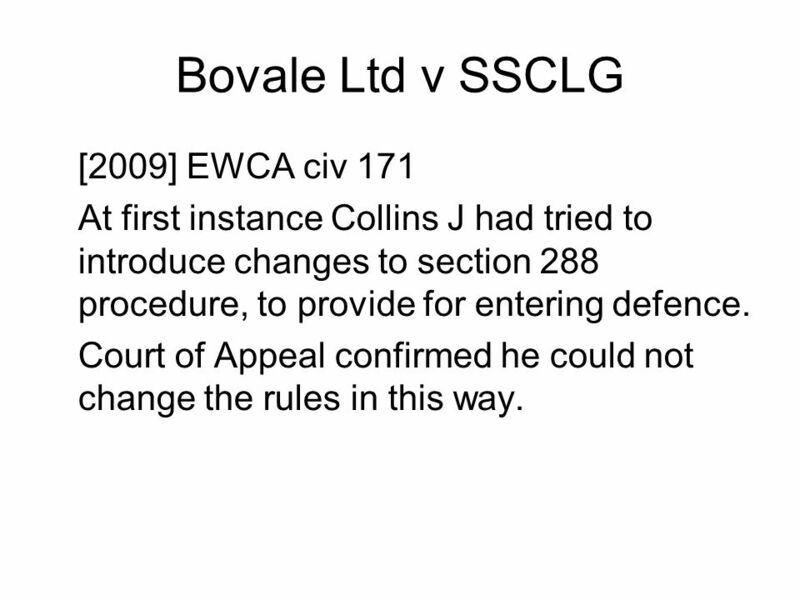 At first instance Collins J had tried to introduce changes to section 288 procedure, to provide for entering defence. Court of Appeal confirmed he could not change the rules in this way. 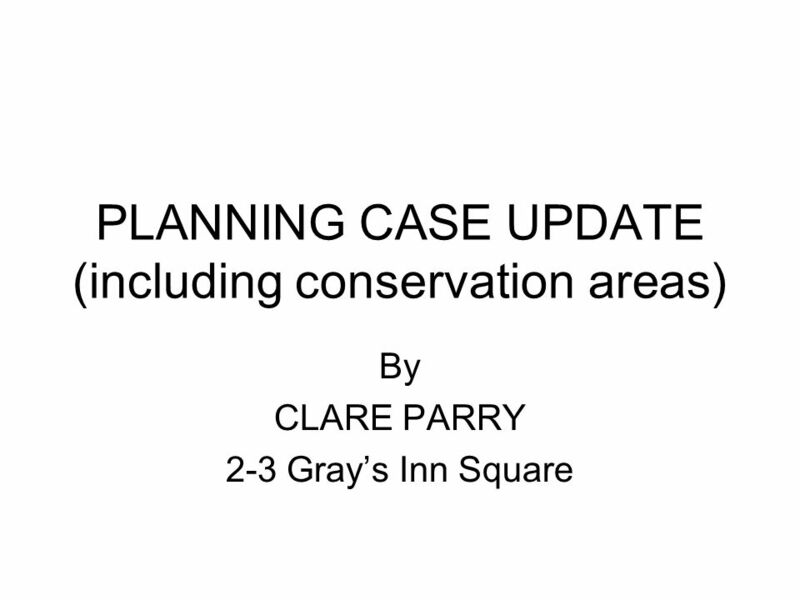 Download ppt "PLANNING CASE UPDATE (including conservation areas)"
ENFORCEMENT DECISIONS; roles and duties of the LPA By Clare Parry 2-3 Grays Inn Square. Centre for Freedom of Information The childhood leukaemia case – learning points in dealing with the balance between access to information and privacy. Designing House Extensions - draft Supplementary Planning Document (SPD) for consultation Eleanor Parker, Development Management. The Municipal Board Making Your Case to the Board Presented by: William Barlow, Chair Lori Lavoie, Vice Chair. LOCAL DEVELOPMENT PLANS LESSONS FROM ACROSS THE BORDER Robin Green. It was unfair to me It was unfair to me External Student re Assessment by Marker who had never met the student. External Student re Assessment by Marker. John Pointing, Barrister Legal Partner, Statutory Nuisance Solutions 1. What is involved in the planning process and who makes the decisions? RTPI – Southampton 20 th April 2011 Southampton Legal Update Gary Grant, Barrister, 12 College Place “The First eleven of 2011” Planning Case Law Update. Local Authority Lawyers’ Seminar 15 th November 2006 LOCAL POLITICS AND DECISION MAKING James Findlay 2-3 Gray’s Inn Square. 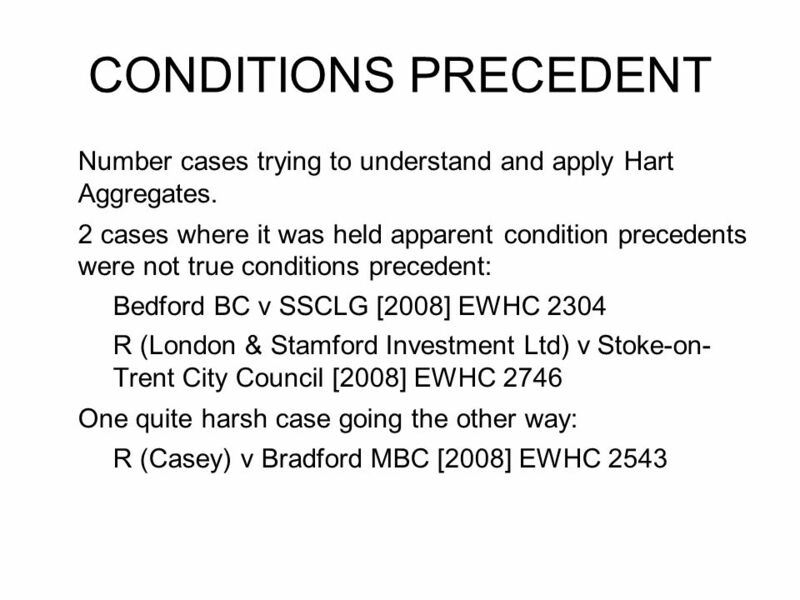 Possession claims update Giles Peaker 24 March 2014. 1 Procedural Issues: Adoption, Amendment, Enforcement, and Appeals. 1 NSW Work Health & Safety Act Session 3 WHS Act. Fire Safety Jonathan Harrison Fire Protection Inspector West Yorkshire Fire & Rescue Authority.